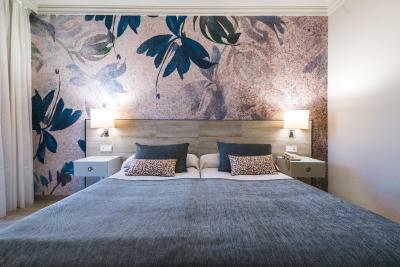 Lock in a great price for Salles Hotel Málaga Centro – rated 8.1 by recent guests! the location. And a couple of the staff. Free wifi, beware they write a 0 with a line through it which we thought was a letter from another language. The charge of 13 euros for parking was okay and the car was secure. I have stayed in the Salles Hotel in Malaga five times now. It is very central to shopping, restaurants, and the historic Old Town with it's beautiful Cathedral, churches and museums. The hotel is clean and the staff are charming. They are currently renovating the bedrooms and they are very nice. The beds are super comfy and I slept like a log ! Breakfast was excellent. Excellent choice. Beds were very comfy. Location was brilliant for the city. The room, and bathroom, where very spacious for a city hotel. The rooftop bar is nice and does a great Mojito. It is very quite although it is in the centre of Malaga. The thing that I loved the most about this hotel was the staff! This is a hotel that understands what service and attention to detail its all about. They helped me with something as simple as directions to arranging a small picnic bag with a continental breakfast that I can take with me to the airport because I was checking out before the regular breakfast was served. The rooms are larger than the usual hotels. 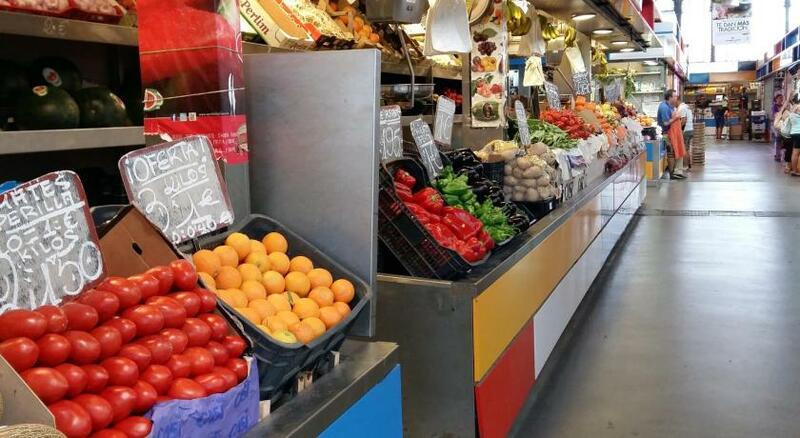 10-minute walk to el Corte Ingles, some of the best restaurants in town are just 5 minutes walk. 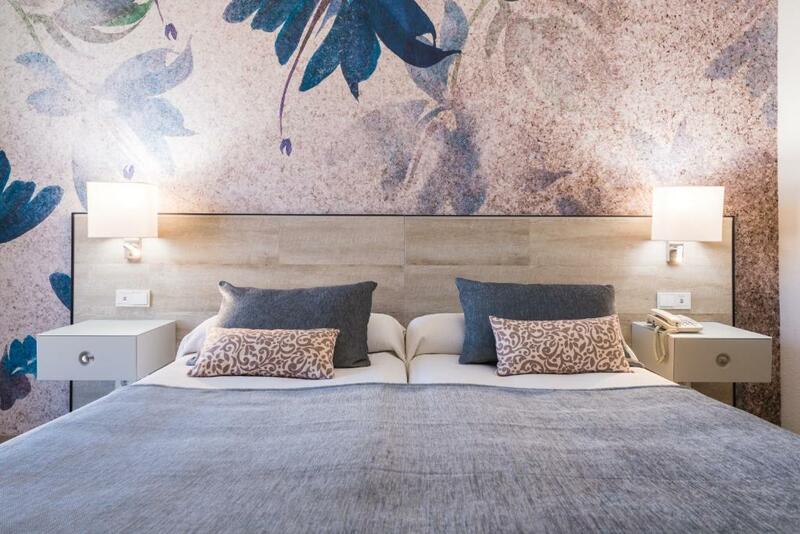 Salles Hotel Málaga Centro This rating is a reflection of how the property compares to the industry standard when it comes to price, facilities and services available. It's based on a self-evaluation by the property. Use this rating to help choose your stay! 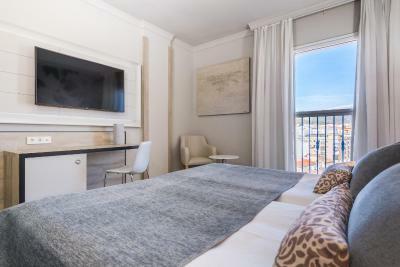 One of our top picks in Málaga.Free Wi-Fi and a seasonal rooftop pool with impressive city views can be found at Salles Hotel Málaga Centro, set less than 5 minutes' walk from Málaga’s picturesque old town. 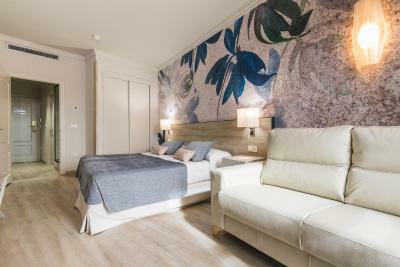 Rooms at the Málaga Centro are brightly decorated and spacious. Each room has satellite TV and exterior views. The Málaga Centro’s Guernica Restaurant serves a range of Mediterranean and Andalusian cuisine. The Picasso Café-Bar serves drinks and snacks. Guests can relax and enjoy city views on the Centro’s rooftop terrace. There is a poolside bar, open in summer. 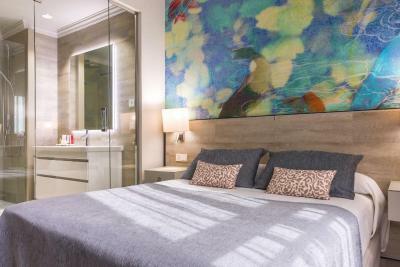 The hotel is a 15-minute walk from the Picasso Museum and less than 0.6 mi from Málaga Cathedral. 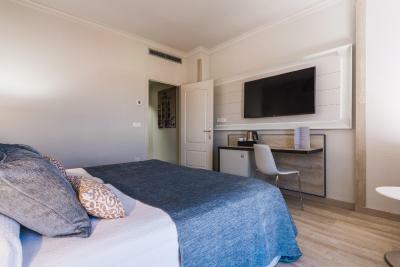 When would you like to stay at Salles Hotel Málaga Centro? This air-conditioned room offers free WiFi and a flat-screen satellite TV. It has wooden floors and includes a safe and work desk. The private bathroom comes with a hairdryer and toiletries. 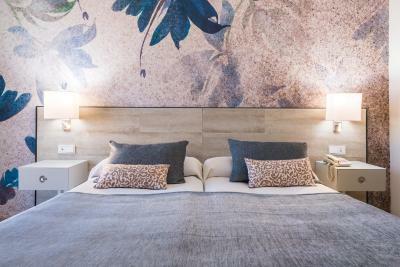 This elegant, air-conditioned room has modern décor and offers free WiFi and a flat-screen satellite TV. It has a safe and a work desk with a special reading lamp. The marble bathroom comes with a hairdryer and toiletries. This air-conditioned room offers free WiFi and a flat-screen satellite TV. It has smart wooden floors and includes a safe and work desk. The private bathroom comes with a hairdryer and toiletries. This room type consists of inter-connecting rooms, one with a double bed and the other with bunk beds. Both rooms include a flat-screen TV. The private bathroom comes with a hairdryer and free toiletries. This smaller economy room has a 4.4 feet bed and offers free WiFi. The private bathroom includes free toiletries. 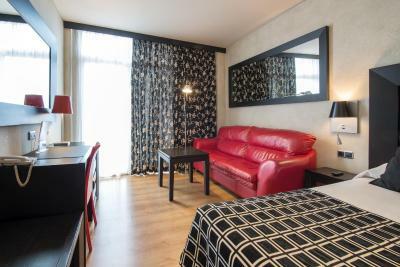 Located in the heart of the old town and business district of the city. It’s the perfect spot to explore the town’s cultural programme and enjoy the multitude of terraces and tapas bars in the centre, or the beach which is only 1.5 Km away. 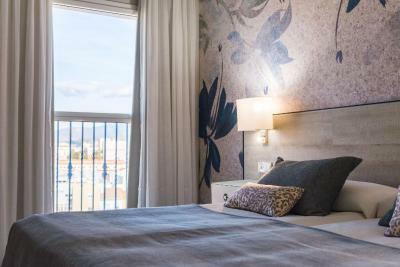 House Rules Salles Hotel Málaga Centro takes special requests – add in the next step! 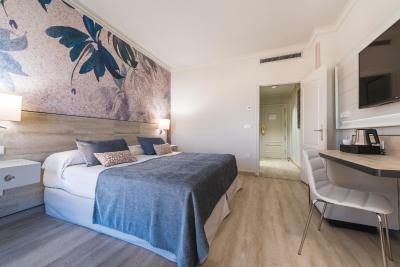 Salles Hotel Málaga Centro accepts these cards and reserves the right to temporarily hold an amount prior to arrival. Please note that private parking on site is limited, subject to availability. Public parking is also possible in the surroundings. The Rooftop bar was amazing! Excellent beds as well. The rooftop bar and swimming pool. Plus the views. I used Booking.com in December when holidaying in Thailand, although the cost of holiday was initially taken from my credit card, I had to settle with the host when i arrived and was informed that Booking.Com took no monies. On this current occasion I thought that situation would be equalled, so, I took Euros to pay at the desk. I was informed that I had paid and all was done. I feel this is very confusing and misleading and after my return I now have to change the Euros back to Sterling (I have lost out on this transaction financially). I feel clarity is needed from Booking.Com around this. The aircon was set for winter at 21deg minimum even though it was well over 20 outside, we had to leave the windows open but this let all the mosquitos in. Nice hotel, close to the centre. Check in and bar staff are very friendly. The rooftop pool and food. It did not affect us as we visited the end of March, but the pool is small and more of a plunge pool for a cool off than a proper swim, but plenty of loungers available for sunbathing. We were given a map at reception, but it did not have many street names on it and we found it a bit misleading! The Malaga tour bus map in the reception area is a better one if you are not familiar with Malaga. A very comfortable stay, room larger than expected, bed very comfortable. Spacious bathroom with a bath and a power shower (shower 10/10, brilliant water pressure and it came on always straight away at the right temperature). 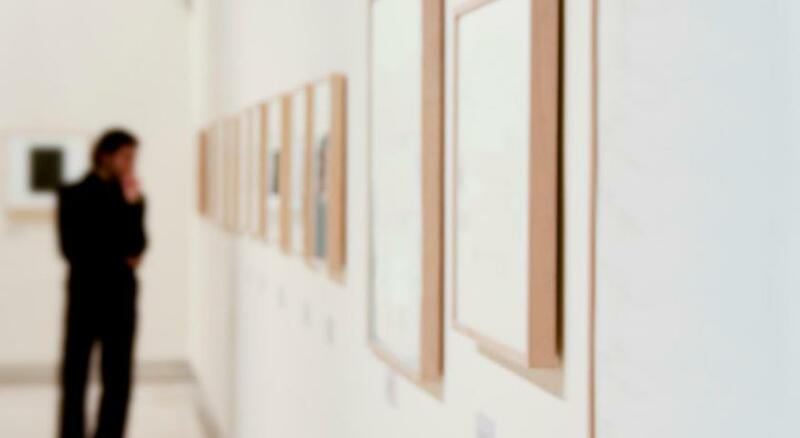 Staff were always happy to help, friendly and answered all questions fully and willingly informative. Plenty of variety of foods available at breakfast. The food was tasty and very fresh and a relaxed atmosphere in the breakfast area. The view from the roof top bar was amazing. The location is great for the old town and about a 10/15 minute walk to the Marina and the beach. The staff was very kind and friendly except one lady at the reception. 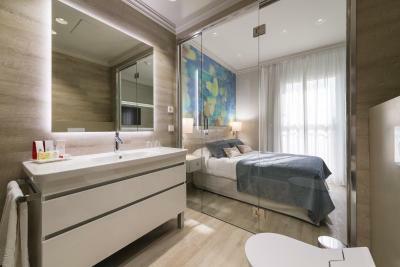 The room was very quiet and stylish, the shower and the whole bathroom very big and clean. The breakfast was extraordinary and never the same, the pool and the location on top very nice. Short walk into the city. The hotel has its own carpark for which we paid 13 Euros for day and overnight parking. Carpark awkward to get to and narrow spaces. There is also a public carpark virtually opposite the hotel. Helpful reception. We arrived early and an alternative room was made available. This was airy, quiet and spotlessly clean. Very comfortable bed. Very good breakfast selection although didn't have time to fully enjoy because of flight timing. Committed, friendly and helpful staff. Very comfortable room and bed and excellent breakfast.